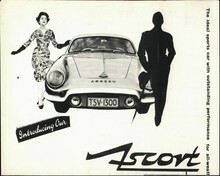 The Ascort TSV 1300 was a limited production fibreglass bodied coupe which was built on a VW floorpan. The car was designed and constructed by Mirek Craney of Sydney Australia between 1959 - 1961. The car was very well conceived and great attention was placed in the detail.